Clematis' Sylvia Denny' is a rather elegant variety with beautiful, pure white, double flowers appearing during early summer, followed by single ones in autumn. This non-evergreen climber is slow growing and is particularly suitable for planting in a container trained up bamboo canes or an obelisk on the patio. It can also be grown up a trellis, garden fence, wall, arches, pillars or pergolas. 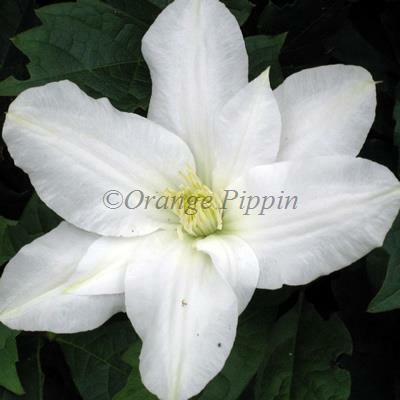 Clematis 'Sylvia Denny' was raised by Mr and Mrs Denny of Denny's Clematis Nursery, Broughton near Preston. It was named after Mrs Denny.